Subscription analytics tools are the best automatic solution to keep complete track of the transaction activities when a user subscribes to your services. 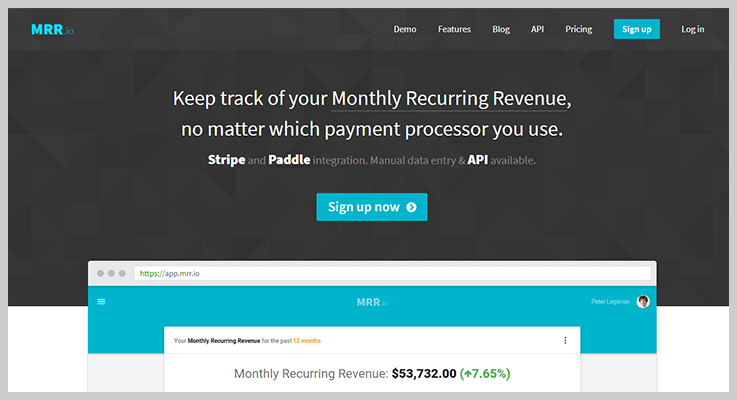 Not only this, you can find detailed stats about various SaaS metrics like MRR, ARR, Net Revenue, churn rate etc. And needless to say, you will always require these values while calculating your business growth. Besides analyzing & managing the current business scenario, these tools will generate a forecasting report so that you can have a prior plan for the services in order to have the best sales in near future. Therefore, by using effective subscription management software, you can simplify a lot of business processes which will eventually help you in the long run. In the below section, we have discussed some of the best subscription analytics tools that will surely help you gauge and measure the sales and performance of your products over time. 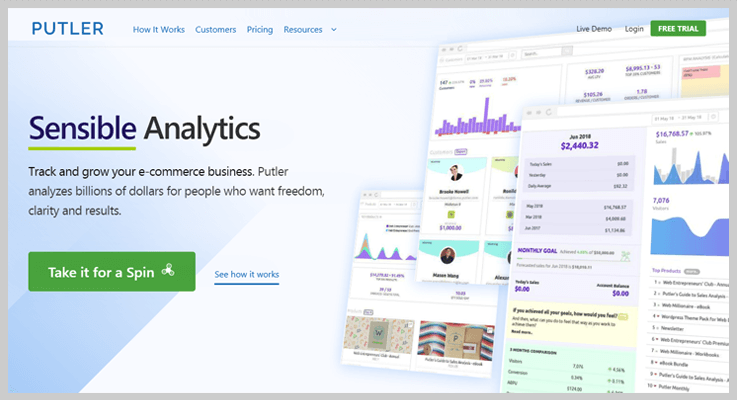 What Will You Really Find in These Subscription Analytics Tools? Moreover, these software will help you to have an entire dedicated dashboard for managing transactions, sales history, payments and product performance single-handedly. Now let’s study these services and features in detail. With Pabbly Subscriptions, you will automatically have a list of all your customers based on their subscription status. For example, trial, live, paid, unpaid, pending, canceled, expired etc. The software schedules the upcoming billing of the users according to their plan upgrade/downgrade. It has records of the data like the last bill, total amount, invoices, subscription created and activated on, and plan chosen by the customer. Moreover, Pabbly Subscriptions helps to recover failed payments via marking the status of the customer as “Dunning”. Further, it automatically starts sending reminder emails to the customer to complete his payment process successfully. 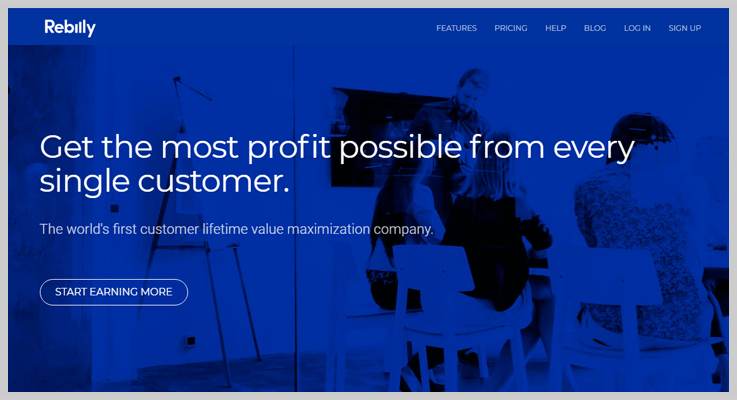 It has a Starter Plan which is available at $5/month where you can manage up to 50 customers and explore all the essential features of Pabbly Subscriptions. You can grab the Rookie Plan at $29/month where you can provide unlimited subscriptions to 1000 customers. Also, you can set up unlimited products and plans & collect unlimited revenue without paying any extra charges. The Pro Plan of this software will also let you have unlimited subscribers at $59/month. Plus, you can collect one time & recurring payments through payment gateways like PayPal & Stripe from the customers. 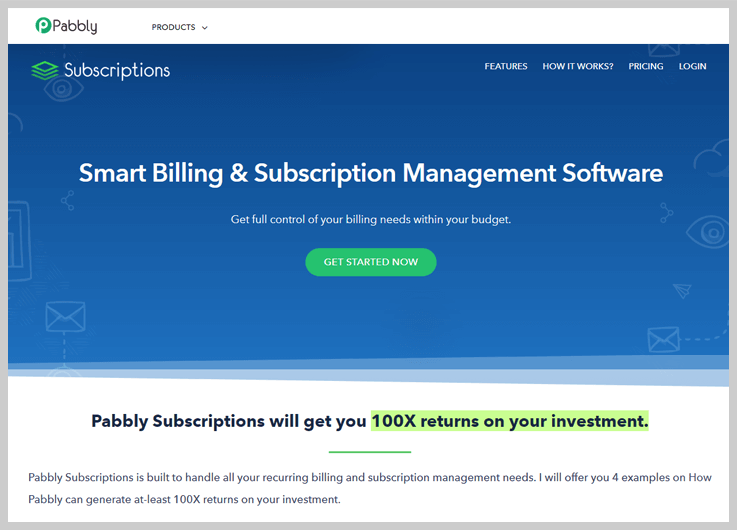 Advance Plan of Pabbly Subscriptions is available at $99/month with maximum features, such as dunning emails for pending/failed payments, custom domain, multilingual checkout page and more. Pabbly Subscriptions provides you with graphical reports on new subscriptions, new customers, active customers, active subscriptions, net revenue, monthly recurring revenue, and all transaction. You can have these reports on the basis of the various time slot. Like for last 30 days, this week/month, last week/month etc. The software lets you access sales analytics i.e. you can access sales data like best selling product, customer churn rate, average revenue per customer etc. Moreover, it supports 25 global currencies. So you don’t have to worry about losing any international client. It has a custom domain feature through which you can customize the domain of your product’s checkout page. After that, you can set it as per your business or professional name. This software provides easy subscription management. You will have a product analysis report having top trending products, sold vs total products, highest refunded products etc. You can also get individual product snippet having a relative up/down a number of position, sales amount, sold quantity & number of customers. Along with it you also get sales report with essential details like net sales, average revenue/sales etc which are calculated in currency as per the available stats. Plus, you can issue the refund quickly & without any hassle. This is because you can search the related transaction quickly and take the required action. This software provides very effective aggregation across multiple businesses, payment gateways, and currencies. Get a free trial for 14 days and a live demo. The Starter Plan will cost you $29/mo for which you get 300 paid orders/month along with 2 integrations. Then there is a Growth Plan available to you at just $79/mo. By spending this amount you can have 3000 paid orders/month and 7 integrations. You can also avail RFM segmentation etc. At $249/mo you can use the Scale Plan. 10,000 paid orders/month & 10 integrations at first place. And now you can have everything from a growth plan along with personalized growth recommendations. Note – All these plans will have features like weekly email digests, goal tracking & forecasting, 153+ metrics & reports, data, sales, products and customer analytics and a lot more. It gives you a subscription report that contains information ARR, MRR, user churn rate, total revenue, user growth rate, subscription refunds and a lot more useful information. This report page will also display subscription status like active, new, canceled, failed, suspended. This software uses RFM (recency, frequency, monetary) analysis so that you can figure out the most profitable customers on the basis of 3 factors. How recently a customer has purchased, how often they purchase, & how much the customer spends on a purchase. This analytics results gives you stats about recent, promising, loyal, needs attention, hibernating customers etc. Plus, you can also have data in % about new, lost & returning customers. The profile enrichment of your customer will let you have important details of every customer which you can export in an excel sheet. This software helps you to look into your business future also. How far you will reach by having monthly revenues, customers etc. It calculates the estimated values on the basis of current statistics. You can create an eye-catching dashboard through which you can manage all your KPI’s quickly at one place. Thus, you can analyze all the key metrics like top sales in a particular country, top selling product etc. in a glance and make better & faster business decisions on the basis of these results. Choose your data source from pre-built integration like Salesforce, Shopify, Twitter, Google Analytics and much more. Just enter your credentials and Databox will automatically fetch your metrics. For eg. if your data source is Facebook you will get metrics on new likes, posts reach (number of unique people who saw your post) and daily user engagement for your page. Free Plan at $0 for a lifetime will provide you 3 dashboards, slack integration, & data refresh which occurs daily. Spend $49 for availing Basic Plan which gives you 10 dashboards, 60+ one-click integrations & hourly data refresh. The Plus Plan is available for you at $99 where you can have 10 users & hourly data refresh, SQL and database integrations. With $249 expenditure for the Business Plan, you will have 20 users, hourly data refresh, company branding, additional security. Note 1. On activating the quarterly pricing plan, you will get 8% off. Also, you can have an annual billing for these plans with 17% off on the price. Note 2. To know the cost estimation for Agency Pricing, you can contact the sales team. The biggest and most popular feature of this tool is that you can have all the track records in a handy way which can be accessible to you anytime. Like you can have the results in your mobile app, smartwatch, desktop, etc. 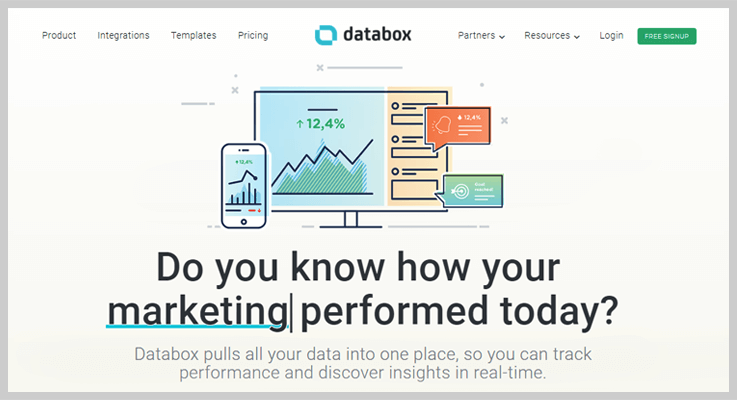 Databox provides you a variety of dashboard templates (100+ free templates) with amazing graphics & design. Google analytics mobile app metrics, play store metrics, iTunes connect are few to name. Along with it, this software lets you integrate with 50+ different data sources to aggregate data. It also gives you other advanced ways to connect your data via providing Databox API. 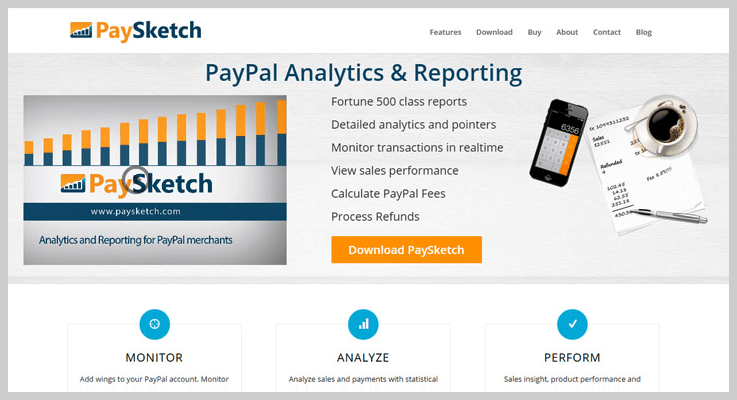 PaySketch is PayPal centric analytics tool. Therefore, the software is dedicatedly designed to handle transactions, sales, payments, products, and customers effectively. To handle analytics and the bulk of PayPal transactions, information metrics like peak order time, order frequency, refunds and customer loyalty are managed in one dashboard. There are individual dashboards containing elaborated information about transactions, sales history, payments and product performance. Each dashboard gives instant search and allows transaction searching via date ranges and transaction status. You can customize the data columns, & the number of transactions to be displayed in each dashboard. Also, this tool lets you use hotspot search & get the sales result by same customer names, email or status. Standard Plan at $7.99 – where you will get 5000 transactions visibility & download PayPal transaction history of past 1 month. Business Plan $9.99 – get transaction visibility up to 20,000, 3 months transaction history report & 1 PayPal account connection. Professional Plan $11.99 – avail 50,000 transaction visibility & 6 months transaction history, Windows & MAC compatible. Standard Plan at $59 – have 5,000 transaction visibility, transaction history up to 1 year, data encryption. Business Plan at $69 – you will get 20,000 transaction visibility, customers & product dashboard, transaction history up to 3 years. Professional Plan at $79 – avail 50,000 transaction visibility, search & reporting dashboard, transaction history up to 6 years & archived transactions. Standard Plan at $99 – get 5,000 transaction visibility, transaction history up to 6 years, automatic synchronization. Business Plan at $129 – have 20,000 transaction visibility, product dashboard, transaction history up to 6 years. Professional Plan at $150 – avail 50,000 transaction visibility, transaction history up to 6 years, unlimited email support. The dashboard will only show results for non-archived (or current) transactions. This helps you to get faster load times, quicker search and rapid results. Product dashboard shows how much each product contributes to the net revenue. There are other indicators pointing to refunds and reversals processed for products. And if these indicators values are high, it depicts negative customer satisfaction. The customer’s dashboard lists all your customers who have made transactions via PayPal gateway. Customer details include their names, email addresses, the total worth of purchases they’ve made. You also get the flexibility of communicating with your customer by email. Bug fixes, Enhancements, and Upgrades are automatic with this software. Plus you get notified on every upgrade & they free for the lifetime. MRR.io not just gives you current stats about MRR, ARR, gross revenue churn, new paying customer etc., but you can also compare the previous reports easily to plan an action for boosting the sale. For example, after analyzing the graph pattern of successive MRR values, you can compare the result with the previous month, 3 months or even a year ago report. And get an idea about overall dip or rise of the revenue. You are also facilitated with advance email reports feature where you will receive all the alert of business metrics via emails. For using Basic Plan you don’t have to spend anything as it is a free plan. You can have up to 100 paying customers, 3 team members & basic email report. The second one is Pro Plan where you get unlimited customers, unlimited team members, cohort analysis, forecasting, advance email report. You can keep on using free plan till the number of paying customers in your account is below 100. With cohort analytics used for customers, the analysis report breaks down into different subgroups. This helps you to focus on individual group rather than observing all the customers as one unit. It is integrated with Stripe & paddle as data sources. Besides data processing from them you can also enter the data manually whenever required or via API provided by this software. The variety of payment processor that is supported by this software is PayPal, Braintree, Authorize.net, Chargebee, Recurly, Salesforce, Chargify etc. This subscription billing automation provides a virtual space (sandbox mode) for testing rebilly configuration. And once you are ready to process live customer data, you can switch to live mode and accept real card payments. Besides customer’s list and it’s details, you can also hold the information about disputes on various issues such as amount, dispute resolved time, acquirer ref no etc. You can add selected fields in your subscription report such as customer id, plan id, renewal time cancel time, etc. By applying filters in these filed elements, you can further refine the result. Similarly, you can add up the desired field in transaction reports such as currency, payment instrument, website id and a lot more. Even the invoice report can have issued time, due time, paid time etc. Get revenue, new customers, canceled subscription & refund details in percentage for past 24 hours on your dashboard to stay updated. Pioneer is a free plan for revenues up to 1,000/m. It is free until you reach your revenue goal. At $149/mo (+ $0.10/transaction fee), you can avail Entrepreneur Plan with revenues upto 50,000/month. Next is Executive Plan at $1,497/mo (+ $0.10/transaction fee) which gives you revenues upto $1,50,000/month, priority phone support etc. Lastly, you can use Enterprise Plan available at $3000/mo for over 1,50,000 revenues along with integration planning & assistance. Other generated reports will have details about users’ payment retry (attempts, successful transaction etc. ), future renewal reports, cumulative subscriptions plan reports etc. Add IP and email addresses, credit cards, device fingerprints etc. of users to a temporary record called greylist. Further, you can assign expiration dates on them, or even permanently blacklist them. With 2 factor authentication, you can provide additional security. As there is no storing of payment card details when a user login, your customer’s payment card details are always safe. With Rebilly’s API, you can directly create an interface with your business applications which is helpful in recurring billing. Schedule retrying soft billing failures i.e. when a card doesn’t go through (due to gateway errors, insufficient funds etc.). Also, you can create automated notifications to handle hard billing failures which are lost/stolen/invalid card. So above are some of the primest subscription analytics tools which you can use to monitor all of your customer’s subscriptions. Moreover, each of these tools are tried and tested before recommending to you and they have served the purpose brilliantly. So, without giving a second thought, you can confidently choose a service which you think will be the best add-on for business. Your suggestions and queries are always welcomed. Drop a comment in the below section whenever you feel like!